This card was created with the 4th in mind.....lots of patriotic - red/wh/blue challenges out there! I decided to keep with those themes, but to make a card that could be an all occasion card as well. DP's from Webster's Pages, decorative pin from Maya Road, cardstock, stamp and twine from PTI, vellum butterfly from K&Co., misc. 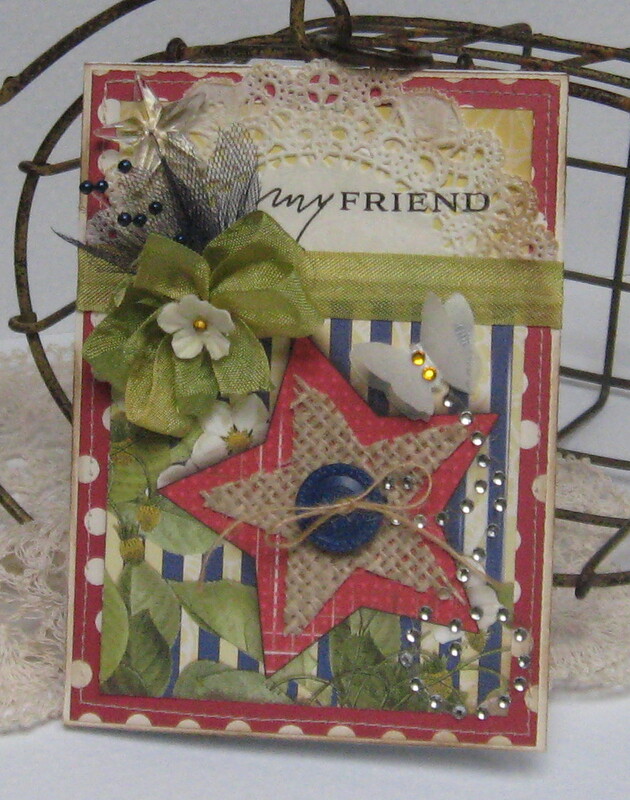 rhinestone flourish, paper doily, vintage button, burlap star and embellishment behind my ribbon. Party Time Tuesday's - Red/Wh/Blue - and I'm sure there are more out there!! great job, thanks for playing @ CTO! ooh, how gorgeous!! love the sweet colors and layering! happy 4th to you Cathy. I saw your card using The Craft's Meow stamp set Butterfly Kisses on flickr, and just had to pop in to tell you how cute it was!! so are all your other cards. This is amazing! Thank you so much for joining us at Cupcake Inspirations this week! this is a great card, I love the combo of different embellies, they go together wondefully. I think if I saw them on your desk before you put them on the card I'd never think they could look so great but each element makes the others look better than they do alone. I hope that made sense to you cause I'm not sure I'm saying very well what I'm thinking. Your card is pure beaut'; love it! Very pretty, I just love it, thanks so much for joining CTO! I am so impressed with this card. I love all the vintage details you've added here and your placement of them is PERFECT!!! I love this!!! Gosh I just went and had to look at your card again....Now I notice burlap! Oh my.....just over the top FAB! Thanks for playing along with OTWC!! I hope to see you back soon! Wow, such beautiful layering. This is a great shabby chic card. Thank you so much for playing along at OTWC.